Aerobic exercise helps avoid a thick waist when focusing on your abs. When you've set your sights on a slimmer, trimmer waist you might tend to go overboard with ab exercises. But if you're putting all of your focus on exercising your abs and not concentrating on getting a well-rounded workout, your waist will thicken up initially instead of getting thinner. That's because you're building ab muscles without eliminating the layer of fat lying over them. The muscle will push the fat out and make it seem solid. You have to include cardio exercise in your workout regimen in order to avoid getting thicker around your waist. It's true that building muscle will burn fat, but aerobic exercise will burn it faster. Whether you participate in resistance training three, four, five days a week or more, make it your goal to do 20 to 45 minutes of cardio four to five days a week. It doesn't have to be in an aerobics or Spin class, either. If you prefer to get your aerobic workout on your own, use the cardio machines at the gym or go swimming, running or biking. If your fitness routine includes one or two days of ab work a week plus four or five cardio workouts and you still notice your waist is getting thicker, you need to adjust your routine. Cut back to minimal ab work and increase your cardio until your metabolism's fat burning balances out with your muscle building. If you're working your abs two days a week, decrease it to one day and drop the number of exercises to three. Add a cardio day and increase the number of minutes you spend doing aerobic exercise. Everyone's body is different, so you may have to tweak your routine a couple of times before you start to get the results you want to see. Personal trainer Matt Siaperas tells clients to give a new routine two to three weeks to see how the body reacts before adjusting it again. With cardio to trim the fat away, a variety of exercises in your ab workout will help tone up all of your ab muscles to give you the trim waist you want. Stew Smith of Military.com recommends an assortment of crunches including double crunches, reverse crunches and 10-second crunches along with cross-over situps, half situps, scissors and hip rollers. It's frustrating to work out regularly and still see your waist get thick. 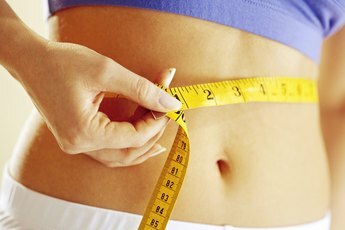 If you're doing everything right but find your waist isn't trimming down, the culprit might be the stress level in your life. In her article "6 Strategies for Losing the Spare Tire" for the American Council on Exercise, Beth Shepard says chronic stress causes your body to hold onto and even increase abdominal fat. Alleviating that stress will allow your workout to finally start working. Stress reducing can start with getting enough sleep, talking things out instead of holding emotions in, getting a massage or attending a yoga class.